Taking your farm in a different direction or starting a new enterprise is an intimidating task. Leasing pastureland is the most advantageous way to do so when you need grass but want to minimize risk and debt. Leasing land can benefit almost any farmer in any situation. It should be your first consideration in looking for land if you are young, new to agriculture, planning to expand an enterprise you already run, have limited financial resources, or for any reason are reluctant to buy land. As a 22-year-old rancher with student loans to pay, I am starting from the ground up with little capital. 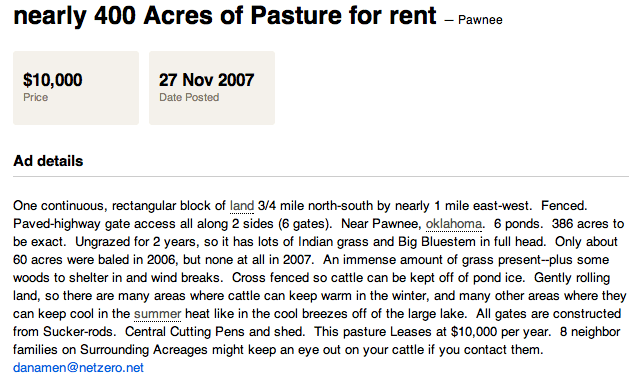 Leasing pasture makes so much more sense for someone in my situation than buying a farm. You don’t need to come up with a down payment, and the lease payments can be negotiated with your landowner. You can work out an amount and payment schedule that works for you, rather than being required to meet a bank’s strict terms. True, you will most likely be making regular payments like you would on a mortgage. However, there is no interest or property taxes on a lease. You can obtain land and get started in grazing without going into six figures of debt. It leaves your money free for purchases that will bring a faster return on your investment, such as buying animals. Maximum income with little associated debt is the most important goal for a fledgling farm business. Though short contracts (less than 5 years) are not recommended, leases are far less permanent than buying property. Buying and selling land is a lengthy process that involves much paperwork, stress and red tape. The opportunity to renew or discontinue a lease every few years gives your business flexibility to grow and change. An informal one-page contract is usually all you need. If you’re not sure you want to commit to farming or living in your current area forever, lease before you buy. As I will discuss later, you choose your lease period to align with your goals and your landowner’s. 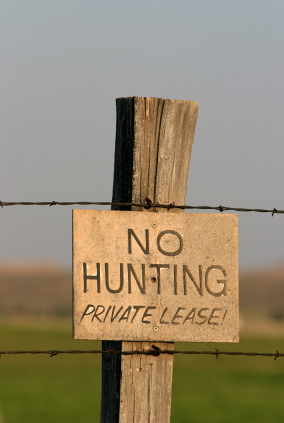 Before you start looking for land to lease, make a mental or written list of requirements. What is the maximum distance from your house or farm that you are willing to travel? Closer is always better, especially if a fence goes down or a calf needs to be pulled. How many acres do you want to start with, and how many will you want in a few years as your operation grows? What is your timeline for growth? How much fencing, brush clearing and water system construction are you willing to undertake before placing livestock on the land? You have many sources of information available through which to find land. Local farm newspapers and bulletin boards around town often have “for lease” ads. You can place an ad of your own, seeking pasture to rent. Don’t forget to search the internet. Ask around when you’re at the feed store, the sale barn, and at producers’ association meetings. Send e-mails and make phone calls every chance you get. You never know who might know someone, so ask everyone! My mother recently applied for a part-time job at a local racetrack. She mentioned that I’m in the beef business, and the track owner now wants to meet with me about putting cattle on his 100 acres. Keep an eye out for potential leases as you’re driving around. If small brush is beginning to grow up in a field or the fence is in bad shape, it has probably sat idle for a few years. There are many elderly farmers, people with demanding jobs and absentee landowners who aren’t able to work their land, but don’t want to sell it. Plenty of people are looking for a leasee. When word gets around that you’re in the market, it’s very possible that someone will come to you! Hunting land is a good bet. Often the owner only uses it for a couple weeks and would appreciate someone taking care of it the rest of the year. If you see a piece of land you’re interested in, ask the neighbors who owns it. You can find out by getting a plat map from the county courthouse as well. It’s important to shop around and not sign on the first pasture you find. You will probably be tempted to, especially if you’re planning to have animals grazing by a certain date, or you’ve been searching for a long time. Always talk to at least two different landowners and tour their farms before deciding. Five or more years is a long time to regret making a snap decision or choosing the wrong property. 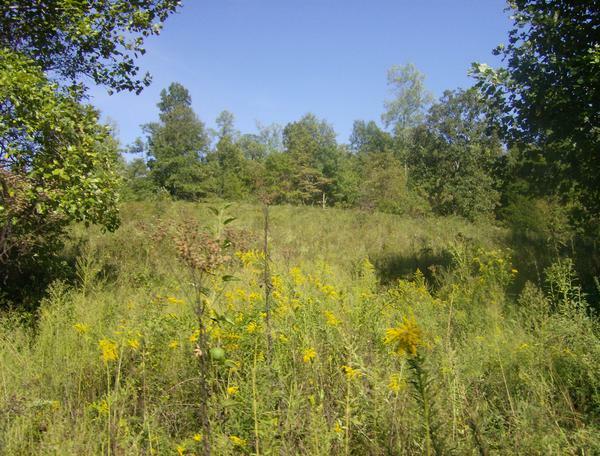 Now that you’ve found a piece of land you’re interested in, it’s time to contact the owner. My next article will explain how to make the “sales pitch” for your grazing services and connect with your landowner. Money Matters, But It’s Not the Only Thing! Hi Meg, real nice article here. I was curious if you knew what an average lease rate would be on land? For instance, if I had 100 head of cattle I would assume it would take 100 acres or so, do you know what folks typically charge to lease per acre? This is one of those questions we consultants don’t like to give a concrete numerical answer to, because the answer differs for every farm. The amount of land you’ll need for 100 head depends on your area and your grazing management. You will need fewer acres for 100 head in the eastern US than in the west, and under mob grazing versus low-density rotation or set stocking. Another of my articles on this site describes how to determine carrying capacity of a certain piece of land. But as an example, I am mob grazing 10 head on 18 acres in western New York. Greg Judy has about 300 head on 1,000 acres in Missouri. This means you’ll need 2-4 acres per head in the eastern or central US. As far as lease rates go, they change as land values change. The most recent data I have is a chart from BEEF magazine in 2012. Cash rent for pasture at that time was anywhere from $5-7 per acre in the southern plains and mountain west, to $28-33 per acre in the corn belt and Great Lakes states (where cropping and development are big competition). The national average was $11.50/acre. I’m sure more recent data is only a Google search away. Thanks for reading my articles, hope this answers your questions! I’m pretty sure Greg Judy wrote a book on this. It’s called “No Risk Ranching”. Its worth a read if you are interested in this subject.